It is likely that at some point in your daily routine – perhaps as you watch the news over breakfast or dinner, or as you check your phone throughout the day – you have heard all the buzz about the strength of the capital markets this year. And now, after last week, the sharp correction of the markets. When looking at the various components of the US equity markets, only a few areas have been driving performance. Growth stocks, and specifically the technology sector, have been the biggest contributor to the market strength. Names like Amazon, Netflix, and Apple have seen positive returns this year well into the double digits. 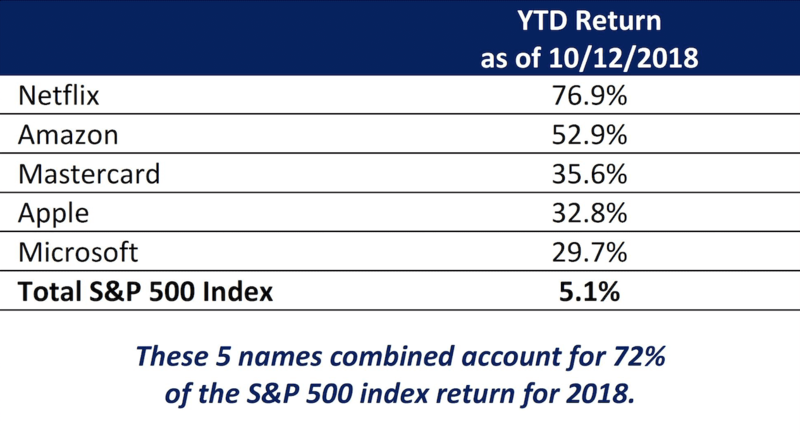 As you’ll see in the chart below, these 5 stocks in the S&P 500 account for almost ¾ of the index’s total return this year. Outside the US stock market, returns are negative. Even though the domestic markets are somewhat positive this year, the international markets are down markedly. They continue to struggle with global trade, Brexit, and other geopolitical issues. In addition, bond markets are also negative this year, as interest rates continue to rise. So, while it may “feel” like every area of the market is doing well this year, this is not the case. Very few investors are 100% invested in the stock market. Very few investor portfolios are 100% in stocks. Most investors hold a diversified portfolio of US and international stocks, bonds, and perhaps other securities depending on their risk level. Therefore, no matter how high or low the US stock market moves, most investor portfolios are not going to move in lock-step with it. While we diversify to help dampen downside risk, this usually limits upside potential at the same time. When it comes to your investment portfolio, the best course of action is to check with your financial advisor when you hear news that has you questioning the make-up of your portfolio and/or returns. Our job is to look after your best interests and it is our intention to keep you on track to meet your long term financial goals. As always, we encourage you to reach out to us if you have any questions about the market environment or your portfolio. In addition, should any of your financial goals, objectives or personal financial positions change, please contact us with those details. Please remember that past performance may not be indicative of future results. Different types of investments involve varying degrees of risk, and there can be no assurance that the future performance of any specific investment, investment strategy, or product will be profitable, equal any corresponding indicated historical performance level(s), be suitable for your portfolio or individual situation, or prove successful. Due to various factors, including changing market conditions and/or applicable laws, the content may no longer be reflective of current opinions or positions. Moreover, you should not assume that any discussion or information contained in this article serves as the receipt of, or as a substitute for, personalized investment advice from Domani. A copy of the Domani’s current written disclosure brochure discussing our advisory services and fees continues to remain available upon request.